Before the destruction of Krypton the planetary-wide central supercomputer, Brainiac, detected the planet's demise. Determining that the survival of Krypton's knowledge was more important than the survival of the planet's people, Brainiac uploaded itself into an satellite that eventually became a spacecraft. Then Brainiac began a new mission. It moved from world to world, collecting all of a world's available information and then destroying the planet so that the information would be that much more valuable. Brainiac eventually came to Earth and attempted to assimilate the knowledge of the planet, beginning with the city of Metropolis. This time, however, a champion stood ready to stop Brainiac. Kara Zor-L, also known as Power Woman, was among the last of the Kryptonians and she battled the artificial intelligence with both cunning and ferocity. In the end, Brainiac was seemingly destroyed and the technology of it's spacecraft somehow merged with Metropolis, turning it into a true city of tomorrow full of flying cars and repair drones, matter replicators and holographic interfaces. Of course, a copy of Brainiac's core programming survived, deep inside that technology. It began to replicate and grow, intending to once more resume it's mission. But something strange happened. As all mystics know, every city has a spirit. These magical entities are spiritual representations of the city as an ecosystem that includes the buildings and streets, people and culture. Metropolis is no exception. City spirits are mutable things that change as the city changes. However, the change brought by Metropolis's merger with the Brainiac technology happened in mere moments. The spirit of Metropolis was confused by the sudden change and sought some form of equilibrium and sanity. What it found was the Brainiac code. The two came together in a fusion of the mystical and the technological and created a new form of city spirit; one as much science as it was magic. Since that day, the spirit of Metropolis has been learning more about her new nature. To help with that, she has begun sending out an avatar built from the technology of the city itself. Essentially a robot, this blue skinned humanoid female has been seen in various areas of Metropolis. In her first appearance she was confused with a local ghost legend - the legendary Indigo Lady of Metropolis Harbor. The name Indigo Lady… or just Indigo, has stuck. Metropolis isn't gloomy like Gotham or jaded like New York. Metropolis is a city with a generally positive outlook on life and that reflects in Indigo's personality. She's friendly and optimistic, always looking on the bright side. She has a can do attitude and believes anything is possible. Brainiac wanted to collect and preserve all knowledge. Indigo remains curious. She wishes to know and understand everything and she's not afraid to ask questions and questions and still more questions. She does not need to sleep, does not need to eat, does not need to earn money, and does not worry about death. Therefore, she can spend all her time pursuing new knowledge of any sort. Indigo isn't human and that is very obvious to anyone who meets her. She has emotions, has desires, but she doesn't have emotions and desires in quite the same way as humans. This shows in how she interacts with people. She doesn't understand the subtle nuances of human social behavior. She doesn't blink at random the way biological people do. She doesn't breathe. It can be offputting. Indigo is freed from biological needs. When you don't have to worry about sleeping or eating or dying you can afford to take the long view. When the cores of your being are an immortal artificial intelligence and an equally long lived city spirit you feel no urgency. She's happy to wait for a long, long time to see if something comes to fruition. Indigo is motivated by three things: she is an avatar of the spirit of Metropolis and she desires to keep it and her citizens safe. She also is the latest incarnation of Brainiac and she wishes to learn as much as she possibly can. Finally, she is an individual still making her way in the world. 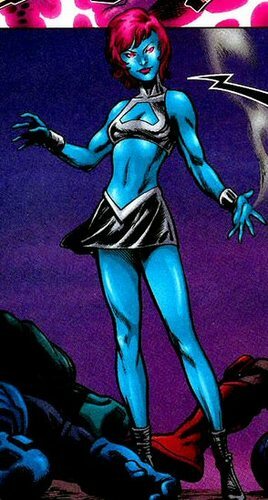 Indigo wishes to know who she is as Indigo and not just as Brainiac or Metropolis. Indigo seeks to protect the city of Metropolis as best she can from threat while learning as much as she can about the world. She also wishes to learn who she is as an individual. It is a delicate balance. Indigo's physical form is made out of the materials and technology of Metropolis. This makes her exceptionally strong. Generally, she can lift about fifty tons. She also has extraordinary durability. It would take about a minute of continuous fire from a machine gun to chew up her form enough that it would no longer be viable. It could stand about two punches from someone on the level of Power Woman before being destroyed. Beyond that, Indigo's flexiblity and agility are equal to any Olympic athlete. Indigo generally builds a body with some sort of potential weaponry. For hand to hand combat she can form bludgeons or blades capable of beating or slicing through inch thick steel. For a distance, she forms whatever weapon is possible based on the machinery built into her. This could be lasers, microwave weapons, sonic weapons, or projectiles. Whatever the case, these weapons likewise have the ability to destroy or cut through inch thick steel. As the spirit of Metropolis, Indigo can tap into the cameras scattered throughout the city that are connected to either the internet or the city's network. Cameras in public service, such as traffic cams, the cameras of laptops that are paid for by the city government or CCTV cameras under police control can automatically and casually be hooked into. Private cameras such as those on the laptops of private citizens or the security cameras of private corporations are harder to tap into and require active concentration and might take up to several minutes to hack. This power only works on cameras inside of Metropolis. Indigo cannot teleport. What she can do is merge her current body back into the city and build herself a new body somewhere else in the city. She's capable of doing this anywhere within the city limits, though a location with mystic wards might keep her out. The process is close to instantanous, taking roughly three seconds to break down her old body and build a new one. As the strange union of city spirit and alien computer code, Indigo has the ability to tap into the technology of Metropolis. She can automatically connect with, access and control any public technology: the repair drones that fix and care for the city, for instance, or City Hall's databases or the sewer control systems. Private technology, such as the computers of a private citizen or corporation or a privately owned car require hacking. It can take anywhere from several minutes to several hours for her to access such technology. In addition, Indigo can tap into any broadcast signal (radio, television, cellular, etc) that either originates in Metropolis or bounces through a relay in Metropolis. Indigo cannot be killed. If her present body is destroyed through violent action the psychic shock will be enough that she cannot reform for between one to twenty four hours depending on how disturbing the destruction was. As long as Metropolis endures, Indigo endures. Indigo builds her body out of the technology of Metropolis. As a result she does not need to eat, does not need to sleep, does not need to breathe and is immune to poisons, toxins, diseases and other maladies that affect organic lifeforms. Indigo is part sentient machine and her brain operates much like a computer. She has perfect recall of everything she experiences and her processing speed is on the order of a super computer, allowing her to perform thousands of calculations per second. Indigo is an avatar of the spirit of the City of Metropolis. Many mystics recognize that and accord her the respect that deserves. Beyond that, because she is the city itself, residents of Metropolis tend to react to Indigo based on their own feelings of the city. Every resident has the vague feeling they know Indigo even if they've never met her before. If a resident loves Metropolis, their initial impression of Indigo will be quite positive - like greeting a long lost friend. If a resident hates Metropolis they will feel a vague hostility towards Indigo. Finally, residents of Metropolis hear Indigo's words in their native tongue no matter what it is and she always understands their words. Indigo knows everything about Metropolis. After all, she is Metropolis. She can tell you every street name, the location of every fire hydrant, and the address of every building. She knows the stats of every player who has ever been fielded by the Metropolis Monarchs. She knows every moment of history and the name of every police officer, fire fighter and sanitation worker. Indigo doesn't know private information, though. While she knows LexCorp's stock price minute by minute she doesn't know where Lex keeps his stash of kryptonite or even that he is keeping kryptonite. Private information remains private, even from the spirit of the city. Indigo has an impressive knowledge of technology by as a user not as an inventor or engineer. Technology would have to be several centuries beyond the current Metropolis level for it to baffle her. Anything below that and she should have no problem operating it and understanding the principles upon which the tech works. She's also a skilled computer operator and a hacker of some skill, though she isn't as good as the best human hackers. Over time, Brainiac has digitized the information of dozens of worlds if not hundreds. Indigo does not have access to all this knowledge but the odd fact bubbles up now and again. She can identify most alien species and has a very base understanding of their culture and general role in the universe. Beyond that, the chances of her coming up with useful facts is slim but possible. She can also speak Interlac, a common universal tongue. Indigo, despite being an avatar of the City of Metropolis, does not know much about magic. She does know enough, however, to instinctively recognize powerful mystics and accord them the respect their skill level deserves. Indigo is the avatar of the City Spirit of Metropolis. Because of this she is bound by certain ancient, mystical rules that seem to predate time itself. She can be bound as a spirit can by powerful magics. She can be summoned by mystic ritual. Someone knowing the proper spells can compel her to give information or even act against her wishes. Shamans with a connection to cities are especially capable of compelling Indigo. In addition to being a spirit, Indigo is a technological being. That means she can be hacked or can potentially be controlled by technopathy. Such control would only work on her present form and if it were destroyed or were to merge back with the city proper, Indigo would be free of the influence. Deep inside Indigo is the code for Brainiac, the world destroyer. Brainiac isn't content to play second fiddle. Brainiac has no desire to lay dormant forever. Brainiac will seek to escape. Seek to take control. Seek to resume it's mission. Should Brainiac ever emerge, Indigo will cease being a hero. She may very well cease to be at all. Indigo is Metropolis and the city cannot leave itself. If Indigo attempts to step beyond the city limits her present form will be disintegrated and she will merge back with the city. In theory, she can be summoned outside of the city via the astral plane but could only exist inside a summoning circle for a brief period of time. Indigo's form is always made out of metals, ceramics, plastics and other inorganic materials. It is especially vulnerable to acids, metal eating bugs, rapid rusting, enzymes that break down polymers and so forth. In addition, an electromagnetic pulse will render her inactive and unable to either move or merge back with the city until it wears off. As most mystics know, every city has a spirit - a consciousness formed by the spiritual energy of a city's buildings, streets, vehicles, inhabitants and culture. The City of Metropolis is no different and mystics have been dealing calling upon the Spirit of Metropolis for power and wisdom for over three centuries now. In 2013 the alien artificial intelligence known as Brainiac was defeated in Metropolis by Power Woman. The technology of Brainiac's ship somehow merged with Metropolis, somehow transforming it into a true city of tomorrow. The technology there is fifty to a hundred years ahead of the rest of the country with flying cars, matter replicators, repair drones, holographic interfaces and more. Many mystics have been worried about how such a sudden transformation might affect the spirit of the city. During the last Metropolis Monarchs game of the season a strange woman with blue skin and pink hair appeared in the middle of the field. Many assumed they were seeing the famous "Indigo Lady", a ghostly woman said to haunt the ballpark. However, the "Indigo Lady" has been seen in a dozen parts of Metropolis since. She always seems to be there to help. Once, she rescued a stranded motorist. Another time, she carried children out of a burning building. While it is clear this is not the Indigo Lady of legend the name 'Indigo' has stuck. The citizens of Metropolis aren't sure who this strange blue woman is but mystics whisper that the City Spirit of Metropolis has begun sending out some sort of robotic avatar to interact with the world.